Rockula – an 80s horror comedy music video! Rockula is a hot 80s mess! It was released in 1990, but it was apparently shot in 1988, which is pretty obvious, because it is so perfectly 1988, gathering together familiar faces that mean something only to kids who grew up in the 80s. Dean Cameron is a vampire who can’t lose his virginity due to a curse that was placed on him when he didn’t save his lady from death centuries ago. Gen-Xers will recognize Dean from the likes of Summer School and Bad Dreams, and for taking over the Sean Penn role of Spicoli in the Fast Times TV series. Toni Basil is Dean’s vampire mother. Toni is my favorite part of the movie. She has the best vampy music performance in the movie, singing a song called “The Night,” while her hot beary boyfriend in glitter and fur watches on. Toni’s dancing is amazing as always. A shame she never had a second hit. Dean’s love returns to relive her death every 20 years or so, giving Dean the chance to save her, but he still hasn’t. She is played by Tawny Fere. In the current day, she’s a young pop star, and she gets to sing a bunch of cool 80s songs that play out as music videos in the movie. 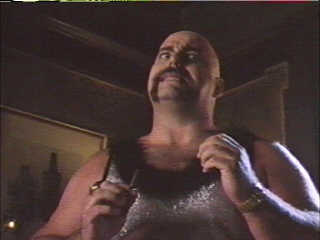 Tawny also happens to have appeared in the movie Angel III: The Final Chapter! 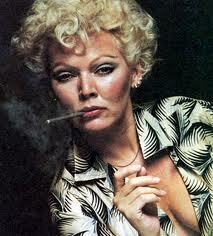 The always zany Susan Tyrell plays the local bartender. Ironically, Susan played Angel’s dear friend in Angel and Avenging Angel, but didn’t return for Angel III! Bo Diddley plays a blues musician at the bar. He’s so versatile. 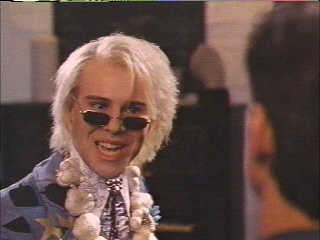 And Thomas Dolby plays Tawny’s ex-boyfriend…and Dean’s new nemesis. It’s just great to see Thomas in something other than the “She Blinded Me with Science” video. Love the animated horror intro to the movie. There’s plenty of cheesy 80s humor, and the plot is simple—Dean wants to get close to Tawny, so he creates his own band: Rockula! Now he just has to prevent her from dying the way she always does: death by pirate. Fully prepare for the movie to end with a swashbuckling sword fight. Still, The Pirate Movie it isn’t. Rocky Horror it isn’t. Yeah, Rockula is bad, but not if you love 80s music, fashion, and horror! Amongst the numerous “music videos” that carry the movie along is an awesome power ballad between our main couple…and an Elvis rendition of the “Rockula” theme song as the final happy ending performance. 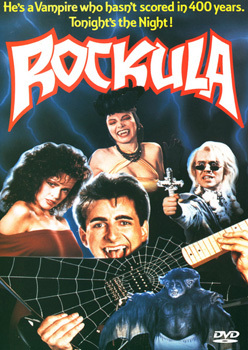 Sadly, Rockula has never been released on DVD and the soundtrack has never made it to CD. This entry was posted in Living in the 80s - forever, Movie Times & Television Schedules - Staying Entertained, Scared Silly - Horror Comedy, Sound Check - The Songs Stuck in My Head, The Evil of the Thriller - Everything Horror and tagged 1980s, 80s, horror comedy, horror musical, Rockula. Bookmark the permalink.